Steven and the Crystal Gems took on Comic-Con at Steven Universe’s very own panel today—and in-between beautiful live songs and some fun tidbits from creator Rebecca Sugar, we got some brief details about what to expect next on the series... like murder. While most of the panel covered questions from fans—and an impromptu performance of “Here Comes a Thought” by Estelle and A.J. Michalka, the voices of Garnet and Stevonnie on the show—Sugar also teased fans with new clips from upcoming episodes of the series, including one of Lars, who will become a space pirate and commandeer a ship to get off Homeworld (having been stuck there with the off-color Gems he and Steven befriended during the most recent arc of the show). 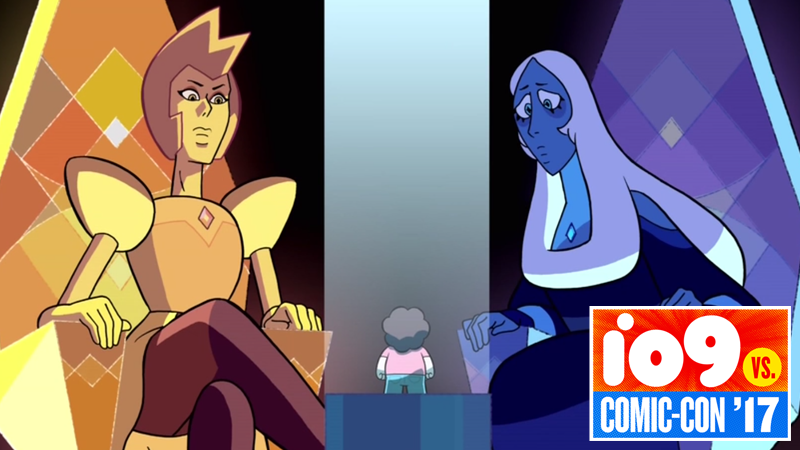 But Lars’ journey back home won’t be the only thread the show picks up on when it returns: The ongoing mystery of who really shattered Pink Diamond that was blown wide open when it was revealed that her death may not have been done by Steven’s mom Rose but was instead a coverup during “The Trial” will play a major part of the next set of episodes, as Steven and the Gems tangle themselves in a murder-mystery inspired bit of detective work.